Just Listed :: Wonderful Smyrna/Vinings Condo! Welcome home! 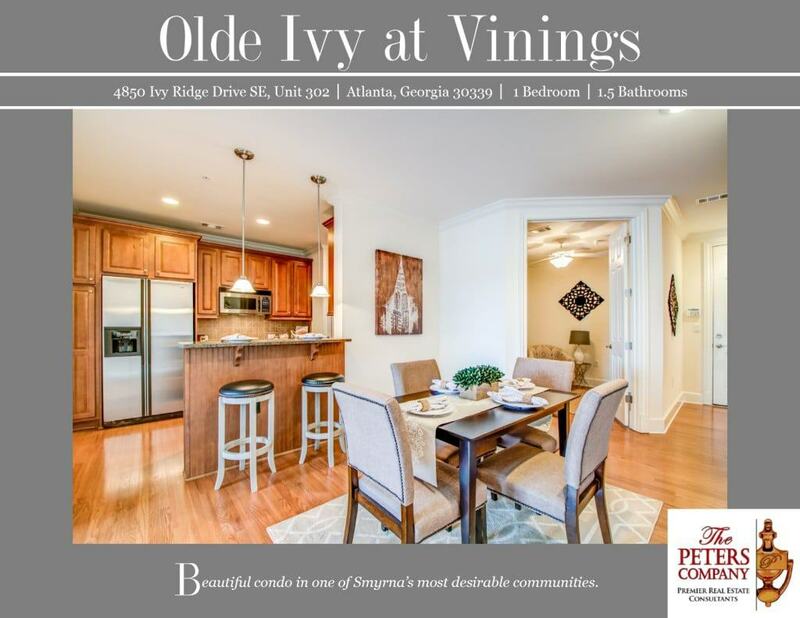 Olde Ivy at Vinings is a wonderful community in the incredibly popular and fast growing Smyrna/Vinings area of Cobb County. The open floor plan, custom features, and charming character of this condo will never go out of style. The close proximity to I-285, I-75, and Atlanta Road makes this property convenient to and from any direction. You’ll also have easy access to the other highways, byways, and activities that make this location such a well-loved destination. You will certainly enjoy being close to Smyrna Market Village, Vinings shopping, and the 61-mile long Silver Comet Trail! Not to mention it’s only minutes to Midtown/Downtown or the northern suburbs! · Gorgeous trim package, gleaming hardwood floors, and extra tall ceilings throughout. · Kitchen features granite counters, stainless steel appliances, pantry, and breakfast bar. · Separate dining area is perfect for entertaining. · Spacious living room boasts large windows and tons of natural light. · Master suite is a true retreat including a walk-in closet and spa-like master bathroom with a double vanity and large walk-in shower. · Additional flex space is ideal for home office. · One assigned parking spot and separate storage unit. · Wonderful community amenities include a pool, clubhouse, gym, secure building access, and gated entrance. ← Just Listed :: Gorgeous Brick Traditional in Brookhaven Heights!